I’m in love with Nikolai Gogol. I say this based on one story in a recently purchased four by five inch book, published by Penguin in 1995—a Penguin 60s—part of Penguin’s 60th anniversary celebrations. 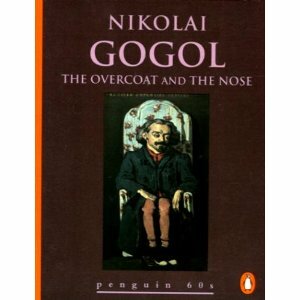 The book contains two stories: ‘The Overcoat’ and ‘The Nose’. It was ‘The Overcoat’ I read Sunday morning. And it was then that I fell in love. In a nutshell, the piece is about a man who needs a new overcoat to survive the winter; he doesn’t ask for much in life and gets even less. But in his way, he’s happy. Though he lives an extremely simple life (the list of his possessions include two buttons that have fallen off some clothing) and has been a devoted employee to his ‘company’ for many years, he has to scrimp and practically starve to save money for the coat and then when he has it, it’s stolen. And no one cares. When he dies he returns as a ghost to steal the overcoats of others. And you wonder why I’m in love? Have you read The Namesake by Jhumpa Lahiri? No, I haven’t. So I immediately googled it to find out why you asked. And now I know! Funny. I’m smitten by that sentence too! This is a brilliant sentence,almost a postcard story in itself. Anne suggested I might try reworking one of the poems I brought to her in a run-on prose style. I’m going to use this as my model. So glad you’ve found Gogol! I too love him. Must get back to Dead Souls, which I began ages ago. I’ve read many of his short stories and agree with your assessment!